Make sure you check Bleeding Espresso’s World Nutella Day Round-up Part 2! And even though it wasn’t a contest, we wanted to thank everyone for participating and we each have selected a “World Nutella Day Co-Host’s Pick” that will receive 2 bars of Fair Trade Chocolate from Modica, Sicily! Scroll down to the very end to see who won! and World Nutella Day Recipes: Clusters, Mousse and Cupcakes! Now onto our other fabulous entries!! Hazelnut Nutella Sandwich Cookies that look great and perfect for next weekend! Grazie, Mary! Nicisme from Cherrapeno whips up some Nutella cream and pipes it into cute little Filo bowls for some Tiny Nutella Filo Cups – Grazie, Nicisme! Chris from Mele Cotte ponders over her numerous recipes using Nutella, eats a Nutella S’more and splurges on a rich-looking Nutella Cheesecake! Grazie, Chris! Pina from Windsor Eats makes some adorable heart-shaped Nutella brownies that I could eat right now! – Grazie, Pina! Clarice from Eating Brittany prepared Crepes with Nutella (Nutella pour les nuls) – Grazie, Clarice! Marguerite from 13 Desserts whipped up a sweet pizza dough and Nutella pizza! Add your own toppings! Grazie, Marguerite! Jo-Ryan from Bedlam on Baltic Avenue adapts a Ramones’ song into an ode to Nutella, complete with photos! Grazie, Jo-Ryan! Michelle from Us vs. Food combines Brownie cookies with a Chocolate-Hazelnut Sour Cream Ganache for something that looks delicious! Grazie, Michelle! Nirvana from Food For Your Mouth reaches her own personal nirvana and makes delicious Crepes with Nutella (recipe in Italian) – Grazie, Nirvana! Cara from The Picky Apple makes a Creamy Nutella Cheesecake with Chocolate Ganache and Toasted Hazelnuts and thinks every day should be World Nutella Day (me, too!) – Grazie, Cara! Anali from Anali’s First Amendment multi-tasks and bakes up some Nutella Banana Muffins while reminding us today is Super Tuesday! Grazie, Anali! Miri from Room for Dessert rolls Nutella up into some beautiful Nutella filled rolled cookies and I suggested another layer of Nutella to give them an extra kick! Grazie, Miri! Maria from Life on Both Sides of the Pond experiments again and again and gives Starbucks a run for its money and makes a delicious Frozen Nutella Coffee Grazie, Maria! Paulina From Taan celebrates the pure tastes of Nutella and dunks some beautiful winter strawberries into it! Grazie, Paulina! Esmeralda from Chocolate and Croissants has Nutella slathered on her delicious Chocolate Nut-Loaf from Pierre Herme’s stash of recipes! Grazie, Esmeralda! Jen from una rata en la cocina inaugurates her blog with her first post and she couldn’t have chosen a better subject – almond-flavored cupcakes with Nutella frosting! Grazie, Jen! Marija from Palachinka joins us from Serbia and contributes Nutella & Plazma Truffles spiked with a little rum! Grazie, Marija! Marla from Bella Baita View contributes an Italian favorite during Carnevale – Bugie Piemontese Style (or Ciacchiere or Frappe depending where you are in Italy) stuffed with Nutella. Yum! Grazie, Marla! Debbie from Piacere pens a haiku about Nutella and feeds some hungry boys Nutella filled chocolate banana cupcakes with Nutella cream cheese frosting – wow! Grazie, Debbie! Susan from Sticky, Gooey, Creamy Chewy flirts with the wrong side of the law with Sogooditshouldbeillegal Triple Chocolate Nutella Semifreddo – a recipe that might get you arrested by reading it! Grazie, Susan! Tara from Foodie revisits her modern version of Gingerbread men – Nutella men! – Grazie, Tara! Jan from Fresh Eyes shares some Nutella Biscotti to give you some strength to make it through Super Tuesday. Grazie, Jan! Angela from Just Another College Foodie contributes not 1, not 2, but 3 easy recipes using Nutella for use in the dorm room, but could be good ideas for a quick Nutella fix for anyone! (Sara’s note: Lucky for me I discovered Nutella when I was almost finished with college) Grazie, Angela! In a double boiler, melt the chocolate and butter, stirring occasionally until smooth. Stir in the grappa, Nutella and espresso, and set aside to cool for 10 minutes. Poor the mixture into a non-reactive baking pan, cover, and refrigerate until well-chilled ands firm, for a few hours or overnight. If after an hour or so, streaks of butter rise to the surface, stir the truffle mixture with a fork and return to the fridge. When the truffle mixture is chilled and firm, spread the cocoa powder on a plate. Scoop up rounded spoonfuls of the chilled truffle mix and shape into balls about an inch in diameter by rolling briefly between your palms. Roll each ball in the cocoa powder until well covered. Arrange the truffles in layers, separating each layer with wax paper to prevent them from sticking together. Well sealed, these truffles will last for at least 2 weeks in the fridge. Wonderful with a small glass of grappa or a shot of freshly brewed espresso. All of these looked so good, even after all my own experiments, I still got a little drool in my mouth looking at the pictures! But, I have to admit the Triple Chocolate Nutella Semifreddo from Sticky, Gooey, Creamy Chewy made my stomach do flips and my arteries sigh – Susan, send me your address! Thanks everyone for participating! 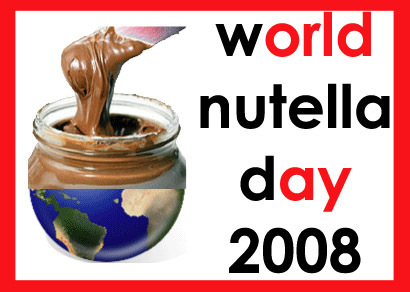 See you next year for World Nutella Day 2009! « World Nutella Day Recipes: Clusters, Mousse and Cupcakes! I loved that semifreddo too :) Congrats to Susan! What fabulous ways to use up Nutella with all these great recipes! I’m off to buy some more – thank you! Fantastic contributions in pts. 1 & 2 and thanks again for hosting! Sara- Wow! I’m flabbergasted! Thank you soooo much! What an unexpected honor. I’m so glad you liked my entry. After having tasted it, I have to say it really is insanely good! wow – and this is only part 1 of the line up? amazing! so much for post-holiday eating lighter! brava!! can’t wait to check out these recipes. So many wonderful recipes!!! Thanks to both of you for doing this. You guys are awesome and inspiring! Thank you! Such fun – so much great baking ahead. Thanks for hosting and/or inventing a great event! Nooooo!!!…. I missed it! All of these look so tasty. This is a group round up…and there’s a part 2? I need to sit…:) Great job! Thanks for another great year.